On hearing news of Friday night’s terrible car crash in Somerset, I felt a shudder down my spine. Whatever the cause – the distraction of an over-charged firework, an “I can see through fog” maniac, an over-tired driver – the government is right to use this accident as an excuse for a proper look at our roads policy. Yet I guarantee that whatever hot air is spouted in the Commons this week, nothing will be done about the terrible state of our long-neglected transport infrastructure. Now I know the following rant won’t be universally accepted, but I guarantee it’ll be popular. Indeed, if I were standing for parliament right now I’d be swept in on a landslide. For what I’m about to say makes common sense: and that’s one thing that successive governments have lacked for the last sixty years when it comes to Britain’s transport policy. 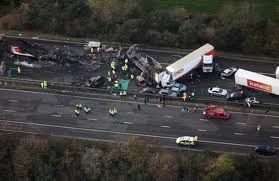 That’s why we have the worst infrastructure in Europe, our trains the most expensive, our roads such an embarrassment. And that’s why crashes like Saturday’s will become ever more frequent. I know that stretch of the M5 well: I used to own a cottage in South Devon. When I bought the house in 1983, the road was a smart new highway and I used it every weekend. It took less than four hours to get down from London on a Friday night. By the nineties, the journey time had reached seven hours or more, so I sold the house. It had become a journey from hell. Our entire motorway network is far too small. Three lane motorways should have been abolished in the 90s, but they’re still considered a luxury – and far too grand for the North East. Up here in Newcastle, we’re supposed to make do with the pathetic two-lane A1(M) – no wonder the M is in brackets. Driving to London is a lottery. It’s less than 300 miles, so you’d think at 70 miles an hour it should take just 4½ hours. Those who’ve done the journey recently will scoff: allow six or seven and you might just see the edge of Luton. So what? say the soggy environmentalists. You should take the train. With what? An East Coast “Anytime” standard return now costs 48 pence a mile. By comparison, the diesel in my car costs me 13 pence a mile: it’s a no-brainer. But I don’t take the car, because I have no idea how long the journey will take. Instead I search the internet for a cheaper advance purchase train ticket, which means the railway dictates my schedule, rather than the other way round. The train will likely be packed, because Britain’s passenger volume has rocketed by 41% in the last ten years, but capacity has increased by just 17%. Meanwhile this government has cancelled plans for sufficient new carriages to cope with demand. There’s a simple solution. It’s so blindingly obvious, only a politician or a Department of Transport civil servant could fail to spot it. It’s tried and tested. And it works. Scrap car duty. Yes, get rid of this pointless tax completely. Instead, make every motorway in the country a smart, wide toll road. It worked in France: it would work here. Where a motorway passes a city, make the outside lane a car-sharing lane, only for vehicles carrying passengers. Start building right now, and watch our unemployment rate fall. Private finance will happily fund it, so it won’t cost the taxpayer a penny. Private operators will bid for the franchise to run them, thereby raising enough cash to fund an increase in train rolling stock capacity. At the same time, set a ceiling on all standard rail fares at 20 pence per mile. That will bring our prices in line with the rest of Europe, and the ongoing cost will be met by a levy on profits from the toll roads. Overnight, gas-guzzling cars will be discouraged, people in rural communities who need their cars will have extra money in their pockets, the motorways will be wide, clear and safe, and train trips to London will be easy, quick, and cheap. Job done. Can I count on your vote, then? Nice one Tom, email it to the jobsworth in charge of roads. Gets my vote!